Δελτίο τύπου: «At long last, the wait is finally over: Shadow Kingdom Records is proud to present Altar of Oblivion's massively anticipated third album, The Seven Spirits, on CD, vinyl LP, and cassette tape formats. Altar of Oblivion are simply one of the best pure METAL bands around right now. The Danish kings proved it with 2012's classic Grand Gesture of Defiance album, they proved it with the teasingly short Barren Grounds EP in 2016, and they prove it more than ever with The Seven Spirits. Arguably more so than any of their no-less-considerable and widely celebrated records, here Altar of Oblivion skillfully glide from morose 'n' mournful DOOM to absolutely EPIC and daresay regal traditional metal, safely evading any cliches or easy classification whilst reverently adding to the rich and enduring lexicon of heavy metal. If anything, this is as close to total '80s metal as the band have gotten - but as always, done in that special Altar of Oblivion way. 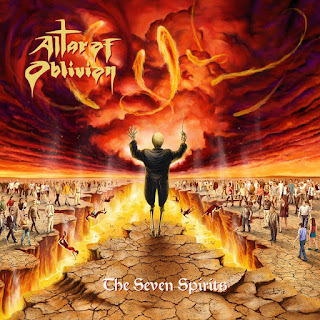 In many ways, each of the seven tracks comprising The Seven Spirits is a tale in its own right, rife with both bloodlust and tragedy, redemption and remorse. They wind along many roads, some darker than others, with a robust 'n' rumbling heft that's simply Altar of Oblivion's heaviest production to date. And yet, for all this fleet-footed thunder, those seven songs remain as passionate and emotional as anything around. Just hearing Mik Mentor's pipes is believing, and on The Seven Spirits, the frontman delivers a performance like no other. These songs could bring you to tears - or galvanize you to conquer any foe before you. METALHEAD 8 Απριλίου 2019 - 10:54 μ.μ. Νομίζω ότι είναι η χρονιά του doom φέτος. BALADEUR 9 Απριλίου 2019 - 12:04 μ.μ.